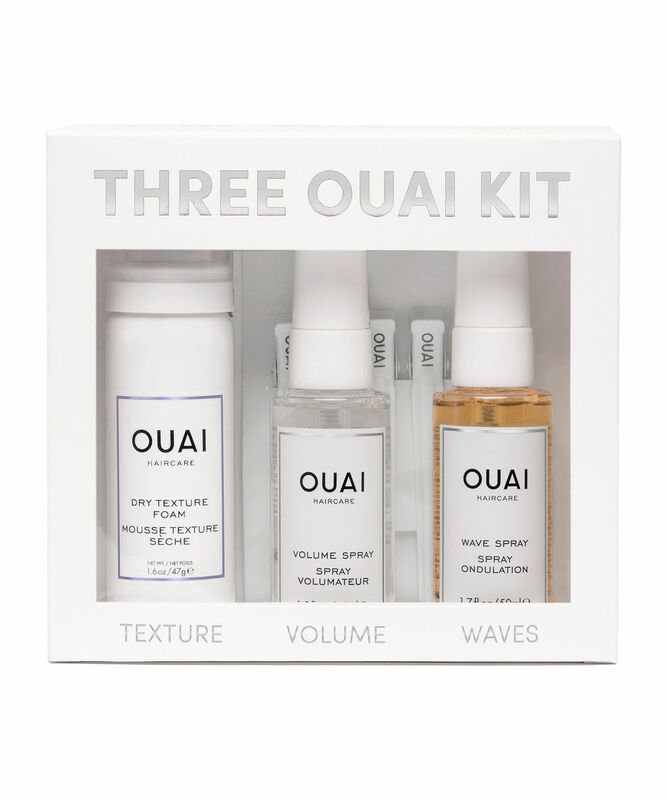 From celebrity coiffeuse Jen Atkin – responsible for maintaining the manes of Klan Kardashian, Gigi Hadid and Gwen Stefani (to name a few) – OUAI’s holiday set combines the Dry Texture Foam (47g), Volume Spray (45ml), Wave Spray (50ml) plus a set of six snow white OUAI-ve hair clips. 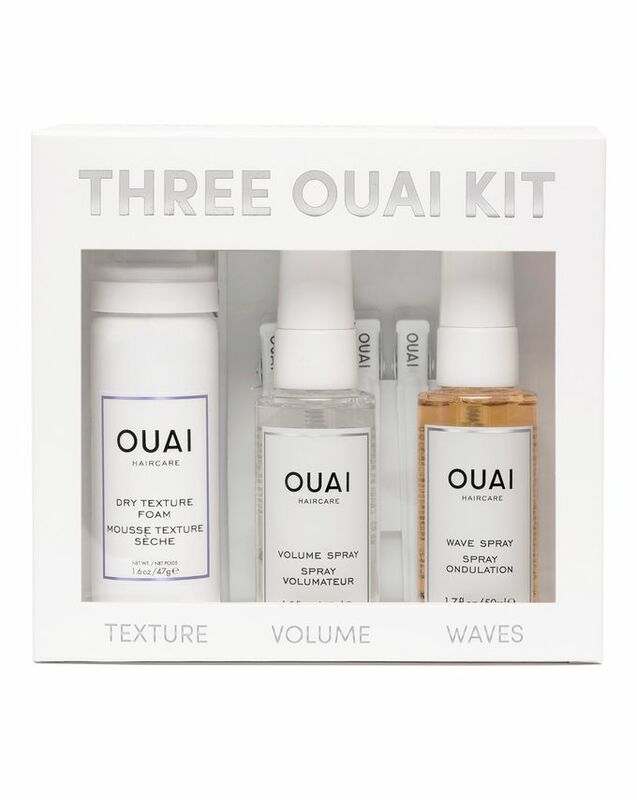 Perfect for adding texture, volume and waves to your hair while you’re on-the-go, this is a must-have for any OUAI devotee or hair aficionado who needs introducing to this Cult brand. Uniting three best-selling products from the OUAI range in mighty but mini forms, this Three OUAI Kit is perfect for taking away on holiday for keeping handy in your bag for on-the-go hair emergencies. OUAI’s Wave Spray grants gorgeous separation and flexible hold while perfuming your hair with its heavenly blend of Italian lemon, rose de mai, magnolia, lily, blackberry, cedarwood, amber, patchouli, sandalwood and white musk. Simply twist still-damp hair and mist lengths with Wave Spray then ‘unravel’ to reveal enviable, ‘French girl’ bed-hair texture. Volume Spray adds an instant ‘oomph’ and backcombed volume without any of the effort or crunch and Dry Texture Foam is invisible, weightless and re-workable – it thickens and refreshes second-day hair perfectly, adding chic piecey-ness and a little ‘oomph’ to hair that may have fallen flat. Finally, there’s six crisp white OUAI-ve clips to help you fake Hollywood curls whenever you want them. Apply to dry hair from the ends up for workable, lived-in looking texture. Blast roots with Texturizing Hair Spray for added lift. Separate dry hair into sections. Spray at the root. Scrunch hair for added lift. Jen Atkin’s tip: If you want to get really crazy, flip your head upside down and spray from roots to ends for hair that’s as wide as it is high. Shake it up. Mist damp or dry hair from root to tip for easy, undone texture and enhanced natural waves. Or, just hit the roots for extra volume. Jen's Tip: Spritz it on damp or dry hair to activate natural waves, enhance texture, boost body and give hair memory.